The epidermis is the outermost layer of our skin. It is the layer we see with our eyes. It contains no blood supply of its own—which is why you can shave your skin and not cause any bleeding despite losing many cells in the process. Assuming, that is, you don’t nick your skin to deep, where the blood supply is actually found. 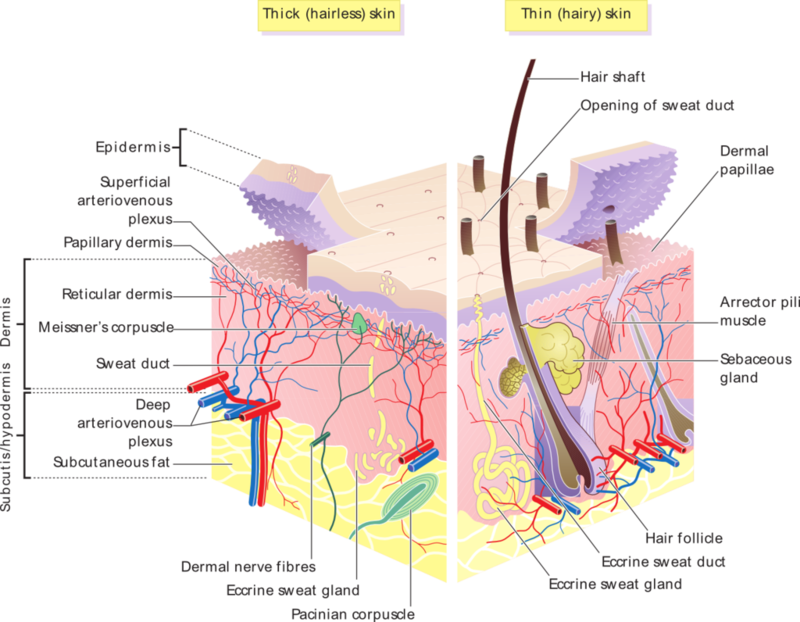 Skin overview: Skin layers, of both hairy and hairless skin. The stratum basale, also called the stratum germinativum, is the basal (base) layer of the epidermis. It is the layer that’s closest to the blood supply lying underneath the epidermis. This layer is one of the most important layers of our skin. This is because it contains the only cells of the epidermis that can divide via the process of mitosis, which means that skin cells germinate here, hence the word germinativum. In this layer, the most numerous cells of the epidermis, called keratinocytes, arise thanks to mitosis. Keratinocytes produce the most important protein of the epidermis. This protein is appropriately called keratin. Keratin makes our skin tough and provides us with much-needed protection from microorganisms, physical harm, and chemical irritation. Millions of these new cells arise in the stratum basale on a daily basis. The newly produced cells push older cells into the upper layers of the epidermis with time. As these older cells move up toward the surface, they change their shape, nuclear, and chemical composition. These changes are, in part, what give the strata their unique characteristics. Layers of the epidermis: The epidermis is made up of 95% keratinocytes but also contains melanocytes, Langerhans cells, Merkel cells, and inflammatory cells. The stratum basale is primarily made up of basal keratinocyte cells, which can be considered the stem cells of the epidermis. They divide to form the keratinocytes of the stratum spinosum, which migrate superficially. From the stratum basale, the keratinocytes move into the stratum spinosum, a layer so called because its cells are spiny-shaped cells. The stratum spinosum is partly responsible for the skin’s strength and flexibility. From there the keratinocytes move into the next layer, called the stratum granulosum. This layer gets its name from the fact that the cells located here contain many granules. The keratinocytes produce a lot of keratin in this layer—they become filled with keratin. This process is known as keratinization. The keratinocytes become flatter, more brittle, and lose their nuclei in the stratum granulosum as well. Once the keratinocytes leave the stratum granulosum, they die and help form the stratum lucidum. This death occurs largely as a result of the distance the keratinocytes find themselves from the rich blood supply the cells of the stratum basale lie on top off. Devoid of nutrients and oxygen, the keratinocytes die as they are pushed towards the surface of our skin. The stratum lucidum is a layer that derives its name from the lucid (clear/transparent) appearance it gives off under a microscope. This layer is only easily found in certain hairless parts of our body, namely the palms of our hands and the soles of our feet. Meaning, the places where our skin is usually the thickest. From the stratum lucidum, the keratinocytes enter the next layer, called the stratum corneum (the horny layer filled with cornified cells). This the only layer of skin we see with our eyes. The keratinocytes in this layer are called corneocytes. They are devoid of almost all of their water and they are completely devoid of a nucleus at this point. They are dead skin cells filled with the tough protein keratin. In essence, they are a protein mass more so than they are a cell. The corneocytes serve as a hard protective layer against environmental trauma, such as abrasions, light, heat, chemicals, and microorganism. The cells of the stratum corneum are also surrounded by lipids (fats) that help repel water as well. These corneocytes are eventually shed into the environment and become part of the dandruff in our hair or the dust around us, which dust mites readily munch on. This entire cycle, from new keratinocyte in the straum basale to a dead cell flaked off into the air, takes between 25–45 days. The epidermis provides a protective waterproof barrier that also keeps pathogens at bay and regulates body temperature. The main layers of the epidermis are: stratum corneum, stratum lucidium, stratum granulosm, stratum spinosum, stratum germinativum (also called stratum basale). Keratinocytes in the stratum basale proliferate during mitosis and the daughter cells move up the strata, changing shape and composition as they undergo multiple stages of cell differentiation. keratinocyte: The predominant cell type in the epidermis, the outermost layer of the skin, constituting 95% of the cells found there. Those keratinocytes found in the basal layer (stratum germinativum) of the skin are sometimes referred to as basal cells or basal keratinocytes. 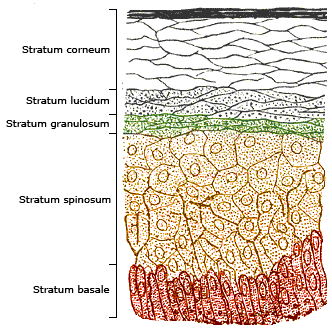 stratum germinativum: The basal layer—sometimes referred to as stratum basale—is the deepest of the five layers of the epidermis. stratum corneum: The most superficial layer of the epidermis from which dead skin sheds. 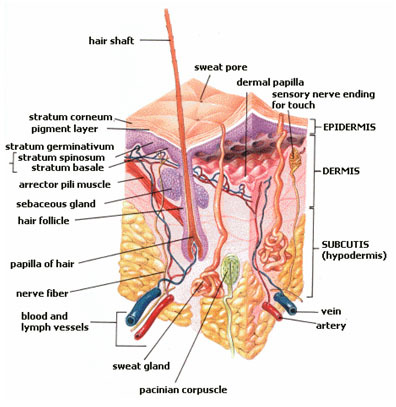 epidermis: The outermost layer of skin. stratum lucidum: A layer of our skin that is found on the palms of our hands and the soles of our feet.